THC gummies combine the best things that the snack and cannabis worlds have to offer. Most people love candy, so taking that product and turning it into a cannabis edible seems like an obvious idea. Today, these kinds of candies are all over dispensary shelves and online outlets in Canada – a testimony to their success. The truth is that if there is a conventional candy, a cannabis variety exists. Best of all, the ingredients are safe and so basic that – with a moderate amount of skill – people can make them at home and customize the items to their personal tastes. If anyone wants to avoid smoking and is looking to expand their horizons beyond simple pot brownies or other pastry edibles, gummies are a great place to start. THC gummies are regular chewy candy (such as gummy worms, bears, etc.) infused with marijuana. Users simply eat it like they would with any normal candy, experiencing a high comparable to other edible extracts. The THC content is measured in milligrams (mg), which allows people to dose the product with relative accuracy. In terms of potency, they are derived directly from dry herb. These do not contain the same massive amounts of THC found in concentrates like isolate, dabs or waxes. Their pleasant flavor and moderate to light potency make them an excellent choice for beginners. The production process behind cannabis gummies is relatively simple. First, manufacturers grind dry herb and heat it in order to turn the inert THC-A into its psychoactive form, THC. This is a process known as “decarboxylation,” which is the same method vaporizers use to turn the THC in dry herb into an inhalable vapor. The next step is to extract the active THC into a tincture. At this point, they place the decarboxylated herb into a “carrier”. The carrier holds the THC so that it may be consumed in an edible format. The carrier in question needs to be a fatty substance, such as butter or oil, in order for the cannabinoids and terpenes to bind themselves to the mixture. Coconut oil is a popular carrier for cannabis oils, as it is considered to be the best edible oil for the job; however, other companies may use medium-chain triglycerides (MCT), which are flavorless and extremely high quality. Those who wish to cook these at home can purchase MCT oil online or at certain health food stores. While the specific steps vary depending on the recipe, producers basically combine conventional candy ingredients with a small amount of tincture. They then place them in molds and let the gummies cool. Once complete, we are left with innocent-looking candies infused with safe, clean THC. THC gummies are edibles. Consequently, they behave the same way when ingested. Because edibles appeal to both recreational and medical users, they are a great way to get high or relieve symptoms without the “hempy” taste some people dislike. For those with no edible experience, one of the biggest questions is “how long do they take to act?” Unfortunately, there is no exact answer. Unlike smoking, which sends the THC directly into the bloodstream through the lungs, gummies and other edibles need to be digested. A lot of factors determine how soon users feel the effects. The time can range from as little as 30 minutes to as long as four hours. A big variable is stomach content. When it comes to digestion and their effects, edibles are a lot like alcohol. Drinking on an empty stomach leads to quick intoxication while consuming alcohol with food delays or suppresses it. The same applies to THC gummies. Without food or liquids in the way, the stomach quickly processes and digests the gummies, sending them to the digestive tract and ultimately the bloodstream; however, when taken right before, during or immediately after eating, expect to wait quite a while. 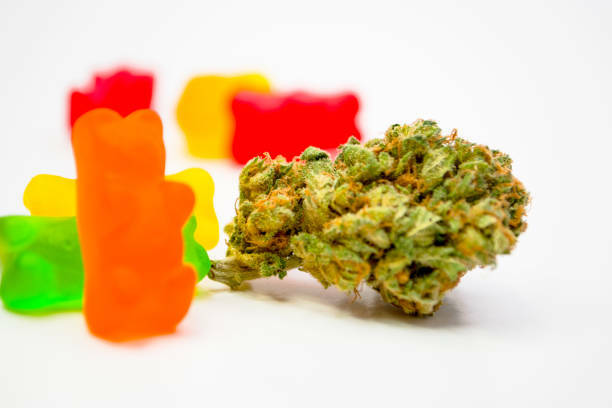 Although slower to act, gummies (and other edibles) tend to provide a steadier, longer-lasting high than their dry herb counterparts. Depending on the THC content and amount consumed, the high could also be stronger. This is something that should always be taken into consideration. A longer high means that users are effectively stuck if they eat too much. 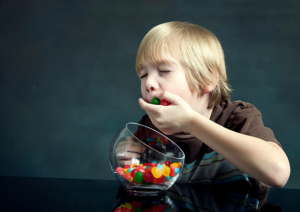 On the surface, this topic seems silly to even address, but there is more to eating THC gummies than simply chewing and swallowing. With normal candy, the biggest concern with eating too much is a tummy ache. Add THC into the mix, on the other hand, and we now have to strike a careful balance to avoid taking too much or too little. The answer to this question all boils down to dosage. Like any medication, too little will fail to address the symptoms (or desired recreational effects). Too much results in complications, such as powerful, unpleasant side effects. Fortunately, it is impossible to overdose on THC, but being too high is far from fun. Add that to the fact that edibles’ effects tend to drag longer compared to dry herb, and we can see why dosage is critical. With CBD edibles dosage you don’t have to be that strict, as it poses no risk of impairment. As we mentioned earlier, things like stomach contents can delay the onset of effects. Regardless, this is no reason to eat a larger amount. While it may take longer to hit, food does not dilute THC. Commercially produced gummies are well-portioned. Distributors design the batches so that each piece contains a fixed amount of THC. In turn, the packaging labels should always reflect this. Again, this all depends on the number of milligrams per piece. Start with the lowest THC concentration available. Interestingly enough, this varies from state to state. In Colorado, for instance, a recreational dose is considered to be 10 mg, so this is the minimum amount found in a single piece. Oregon, on the other hand, offers a minimum of 5 mg. According to Dr. Margaret Gedde – a Colorado physician who works with cannabis patients – 5 mg is a good starting dose for newcomers. In a state where 10 mg is the norm, users can simply cut the gummy in half. Of course, this is not a precise way to dose, as users will have to “eyeball” it. Still, it at least prevents inexperienced people from consuming too much. The route for cannabis connoisseurs is a little bit murky. Some people smoke cannabis for years and are used to doses of 20-30% THC at a given time. Others may also use concentrates, which can range from 60-99.9% purity, depending on the type of product. According to Colorado budtender, Josh Hawkes, 10 mg is an appropriate start for those who used cannabis in the past. Conveniently, this happens to be the minimum concentration in Colorado. Even considering the above guidelines, edible dosing is not an exact science. The only safe way to find the right balance is the ever-famous adage, “start low and go slow”. Begin with the lowest dose possible. Wait at least an hour and see how it feels. If there is no effect, eat a little more. Keep raising the intake incrementally. Put simply, do not rush. Even the most seasoned cannabis users can accidentally take too many THC gummies. If this happens, do not panic. There are two basic ways to handle it. The first way to handle an “overdose” is to simply allow it to pass. 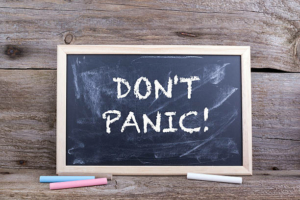 This may seem easier said than done, but try to remain calm. A good way to speed things up is to sleep it off. Relax and get a good night’s rest (or just take a nap). Most – if not all – of the high should clear up by morning. At the very least, sleeping will keep individuals unaware of the unpleasant experience. CBD (cannabidiol) is a non-impairing cannabinoid found in all marijuana strains – but most notably in hemp. Aside from its many medical uses, CBD is an antagonist to THC. In other words, CBD naturally counters the effects of THC. CBD-rich products will help lessen and shorten the high. Ideally, it is best to have some CBD herb handy, as this ensures fast delivery. If dry herb is not available, there are CBD pills, edibles – even cannabidiol gummies – available as well. Everyone should keep CBD products on hand as a sort of failsafe. Out of all the cannabis products, THC gummies are arguably one of the most fun and satisfying choices. The advantages of these products speak for themselves. It is no secret that smoking is bad. Although cannabis is not nearly as saturated with chemicals as cigarettes, the particles given off during combustion can irritate the lungs and throat. Frequent smokers may even have chronic cough or phlegm as their lungs clear out residue and tar. This makes THC gummies a clear choice for nonsmokers. From bears to worms and anything in between, getting bored is virtually impossible. There are always new products emerging, with all kinds of unique flavors and designs. Some gummies are even vegan-friendly. While the gelatin used is typically animal-based, there are products with no animal content. They are also a great choice for people who are allergic to gluten, eggs or anything else found in edibles, like pastries. Gummies alone are delicious. Although many people do like the herb-like taste of pure tinctures, for instance, not everyone is in agreement on that front. Gummies provide recreational and medical users alike with their desired THC and great flavor to boot. Aside from the delayed effect, there are some issues that may cause the consumer to hesitate about THC gummies. Tasty as they may be, THC gummies are no different than regular candy when it comes to nutrition. Put simply, they have no real value in this regard. They are pure sugar, which comes with its own health effects when used in excess. A serious concern for parents is the possibility that children will locate these candies and eat them. Everyone knows that kids love gummies. If they get a hold of this product and gorge themselves on it as kids tend to do, it can make them quite sick and scared. Adults should always keep these products hidden and out of reach. If the children are old enough, explain to them as to why these are off-limits. It is always a good idea to find a childproof container, such as an empty pill bottle, and discreetly store them there.